The cabin is hidden amongst olive trees, in it's own mature garden just 100 metres from the road. Alcaucin village, just 5 minutes by car, has restaurants, bars, shops, a chemist, and bank with cash point. Pool and terrace have been designed with children in mind, providing a safe shallow end for the younger members of the family. The gas BBQ and trees with illumination, complete a perfect setting for al-fresco dining. LA AXARQUIA, the local area. : The Axarquia is a glorious region of Southern Spain, a place rich in history and architecture, from the humblest whitewashed stone cottages to the glorious palaces, mosques and churches, which all reflect the diverse people whose descendants still uphold many of the traditions of bygone days. Visitors to the local villages, especially around the times of harvesting grapes or grain, may find they have walked into a fantastic street party, where the young girls and boys are dressed in traditional flamenco costume, and wine and food may be offered to all comers! Alcaucin is almost at the centre of The Axarquia, set in green hills and valleys which produce the main crop of the region, the olive. We are only 20 minutes drive from VELEZ-MALAGA, the market town of the region, which also has ancient routes, including a recently restored Moorish Fortress. In the narrow streets of the old town, you can find tapas bars offering local dishes, cured hams and wines, including the sweet Moscatel. VELEZ-MALAGA & TORRE-DEL-MAR: On the main road from the town to Torre-del-Mar, (the nearest beach resort, 25 minutes away), there is an extensive new shopping centre, El Ingenio, with supermarket, clothes and fancy goods shops, plus a multi-cine complex which shows films in English and Spanish. On the opposite side of the main road, AQUA-VELEZ is a water park with slides pools and attractions for all ages. Malaga, Nerja, Antequera, Ronda, Cordoba and Seville are all within a reasonable distance for a day's outing. MALAGA: Calle Larios and El Cortes Ingles are a must for shopping.The Picasso Museum & the Museum of Malaga (both closed Mondays), and the Cathedral are all close together. NERJA: A seaside town, with sandy beaches, shops and restaurants. Close to Nerja, the tiny village of MARO is the site of the spectacular subterranean CAVES, where annual concerts are held amongst the stalactites and stalagmites. FURTHER AFIELD: ANTEQUERA: said to have the most churches of any town in the region. East of Antequera is a group of dolmens, ancient burial sites from circia 2,500BC. EL TORCAL. The park is noted for it's unusual weathered rock sculptures, also for eagles and kites. GRANADA: The Alhambra Palace and Gardens, a must see site. Soly Nieve ski slopes are close by in the Sierra Nevada mountains. RONDA:A mountain town built on the cliff above a 600ft. gorge. Reputed to have the oldest bull ring in Spain. CORDOBA:The famous Cathedral in the Mosque is not to be missed. Beautiful Moorish Architecture. MEDINA AZAHARA, 8kms from Cordoba, the ruined City of the Flower, said to be the Versailles of Moorish Art. SEVILLE: A vibrant and flamboyant city, both in it's architecture and it's people. The Bull Ring and the Tobacco Factory of Bizet's Carmen still exist. .........and after sixteen years living here, we haven't seen half of it! REVIEWS........65..........61 5* Please speak to me before Booking. FREE INTERNET WiFi T.V. Many channels News, Sports (Sky eg.) Films & Cartoons. Hair driers in both shower rooms. Fan heaters/ cooler. Lots of room for several cars, next to Cabin. & Covered car-port. TV, DVD player, WiFi T.V. all the channels. Sky Sports etc. AND MANY 'WINE' GLASSES...."OF COURSE"
Boats (with or without) Captain. Tennis at Torre Del Mar, 25 kls. Golf at Torre Del Mar. Baviera Golf. Fully equipped, beautiful garden in lovely rural location, charming and helpful host, perfect pool and sitting out area, sun every day. Can't ask for more ! Many thanks for that review. It could not have been better. I hope that you visit The Cabin again. We had a wonderful restful time at the Cabin. The accommodation and garden complete with pool were excellent and contributed to a wonderful relaxing holiday. Mike is such a wonderful kind host and was most helpful in every way. Many thanks Mike... The area itself high up in the mountains was spectacular and made a very pleasant change from the sometimes crowded resorts closer to the coast. Visitors to the Cabin won't be disappointed! I am so glad that you enjoyed a restful time, away from the hustle and bustle of the coast. I hope to see you both again, when you feel like a rest. The 'sun' shines most of the year. Having been recommended the Cabin by friends, it certainly lived up to its billing. 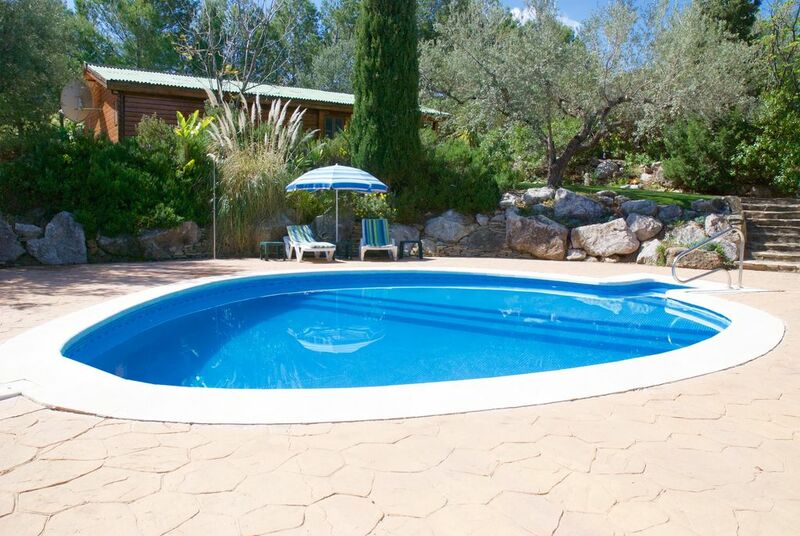 Very comfortable chalet, stunning surroundings, readily accessible and a beautiful pool area. We could easily have spent all week lounging by the pool, and our two young children loved swimming and splashing about. In fact, our eldest learned to swim here in the week we were away. We left the Cabin and the local area feeling like we'd had a proper rest - and have already booked to return next year. Mike is a wonderful host and nothing is too much trouble. Thoroughly recommended. Jess, Steve, Rosa and Dylan. Lovely little cabin! Perfect for a small family! That was a quick response. Thank you. Another wonderful week in paradise! Thank you Mike for another wonderful week in your Cabin. There's everything anyone could need in this lovely cabin in a fabulous setting. Fully equipped, excellent air con, good wifi and TV. Pool is just ideal - plenty big enough for 4 adults to wallow in but also absolutely great for toddlers - our two year old grand-daughter spent hours happily splashing around. Lots of toys and inflatables, comfy sun beds and big umbrellas for shade. Pretty garden too - supper often taken under the big olive tree. Ideally situated for Alcausin or the coast, shopping, eating or just relaxing away from it all in the secluded location of the cabin's peace and quiet. Mike's friendly help always on hand - we couldn't hope for a better host. We'll certainly be back for a third visit before too long. Thank you so much for your review. Just perfect! vacationer would like to read. I am glad that you and the family had a good holiday. This will impress any would-be enquirers. The cabin is situated on the outskirts of the mountain village of Alcaucin, 65kms from Malaga Airport, (access by motorway and good roads), and 10minutes from Lake Vinuela. Alcaucin is set in the foothills of the Tejeda mountain range, at the base of Maroma, the highest peak, at 6,000feet. The area is a designated Nature Reserve, home to a rare wild mountain goat, and is favourite with walkers and climbers. Close to the cabin is a small English run riding stable, that arranges local trekking. The area is very well provided with restaurants and tapas bars, including two British. Torre del Mar, the nearest Coastal town, has a large traditional market on Thursday mornings. Only an hour and a half from the city of Granada, with its famous Alhambra Palace and gardens, and the most southerly ski slopes in Europe. Nerja, and the famous caves of Maro are 30 minutes away. The nearest golf courses are about 30 minutes drive away. Ski: Sierra Nevada. About One & a half hours from Alcaucin. SORRY, NO PETS & NO SMOKING INSIDE THE CABIN. Rental Rates include Air Conditioning, heating and lighting. Booking confirmed only upon receipt of Deposit of 20% . Remainder to be paid in full 6 weeks before holiday start date. Payment by direct bank transfer in UK Sterling, contact owners for details. The deposit and final payment are non-refundable in cases of cancellation, since we may not be able to re-let, particularly at short notice.